Wing It® is the fiery, finger-licking Buffalo wing sauce brought to fame by a Hartford restaurant that bore its name. Packaged in potent glass jars, our sauce lets Buffalo wing addicts (we know you’re out there!) get their hot wing fix in the privacy of their own homes. Wing It® also helps you save, since a little splash of its powerful formula goes a long, long way. Wing It® is really the smarter choice! One jar of sauce is enough for 15 pounds of wings, but it can make a lot more that just wings. Once a mecca for Buffalo wing lovers statewide, the Wing It restaurant garnered numerous local citations, including Connecticut Magazine’s Best Wings Award in 1990. It also won the coveted Summit Award, presented at the Taste of Hartford’s food festival, four years in a row. Wing It still holds the record for the most portions served (over 26,000) at this three day annual event. The popular wing joint in Hartford’s Richardson Mall opened in 1986 and closed its doors in 1991. But the secret of the special recipe lived on! The secret to great wings is available to anyone thanks to Wing It® Authentic Buffalo Style Chicken Wing Sauce, available at supermarkets in New England and throughout the country. 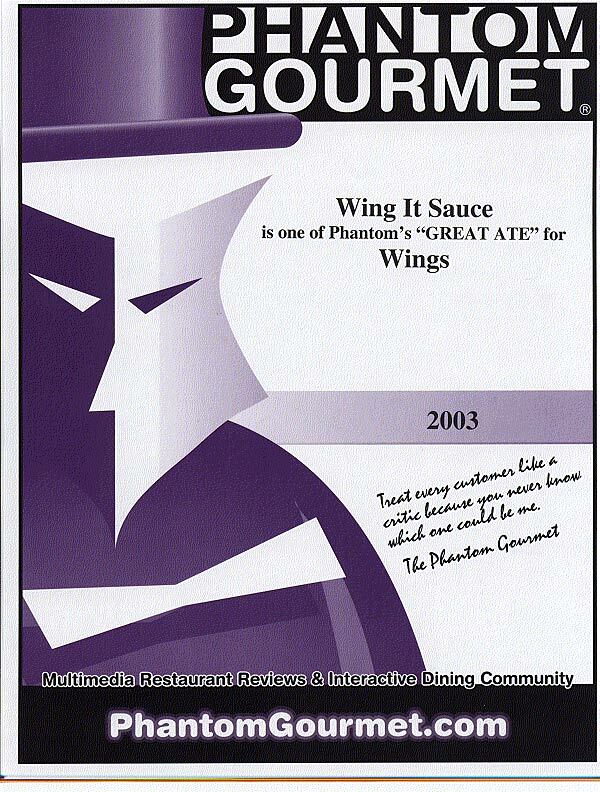 In 2003, the Phantom Gourmet, a New England food critic icon, chose Buffalo Style as the Best Wing Sauce. Since then, we’ve added three new flavors: Honey BBQ, Sweet ‘n Tangy, and Teriyaki. Each comes in a ready-to-use glass jar and makes 15 lbs. of yummy sweet wings. Cook ’em… Toss ’em… Eat ’em… Wing It® is also great as a dipping sauce or condiment, and can make your recipes come to life. Find Wing It® at a store near you, or order online. Wing It® is also available in gallon case packs. Your restaurant will sell more wings at a very low cost per serving. Please call or email us for a personal quote.